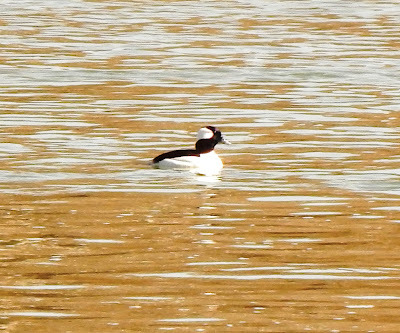 Among our smallest ducks, Buffleheads (Bucephala albeola) are one of the most noticeable winter ducks along rivers and large waterways. Their common name is a corruption of "buffalo" and "head" due to the oversize appearance of their heads, particularly in the drakes (males). Their Genus Bucephala is also Greek for "broad forehead" or "bull-headed." The rest of their scientific name albeola is Latin for "little white" and refers to the overall look of the small adult drakes as well. Linnaeus originally named them Anas albeola in 1758. This diminutive waterfowl, the smallest diving duck we have, with the Green-winged Teal being its only challenger to smallest duck in all North America, averages 14 inches and rarely gets to over a pound and a half. It has numerous other common names including Black-and White Duck, Bumblebee Duck, Butterbowl, and Butterball. The latter two names can refer to its chubby shape, or to the amount of butter that needs to be added to make these game birds palatable. They are also sometimes called "Pound of Butter" due to their shape, average weight, and again the amount of butter needed to make them them edible. Though these tiny ducks have a chubby, big headed look to them, the adult males (drakes) are also quite striking. From a distance they have strongly contrasting black and white appearance. In reality, when seen closeup, their head colors have a glossy greenish and purplish gleam to them. It makes them quite distinctive even from a distance. The females and first year males are a darker overall color with a distinctive white cheek patch behind the eye, which along with size differentiates them from their larger cousins in the same Genus, the Goldeneyes. 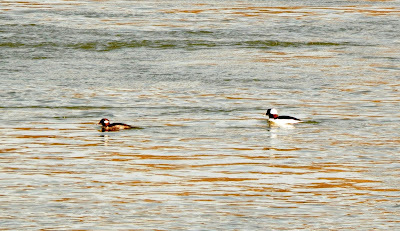 A Bufflehead drake follows a hen along the water. The diet of Butterballs is about 80% animal matter. The food preferences change seasonally. About 40% of their summer diet consists of insects such as dragonfly and damselfly nymphs. This changes to crustaceans, mollusks and occasional fish in the winter, particularly since many spend winters in open shallow saltwater bays and estuaries where insects are scarce. 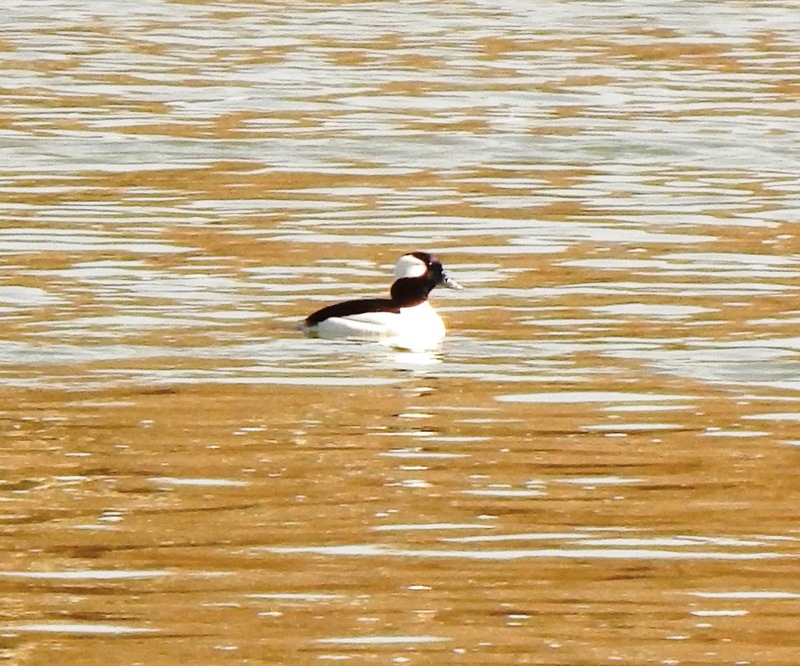 Like most diving ducks, Buffleheads have to run or patter along the surface prior to being able to get airborne. But these little divers don't need near as much of a take-off strip as most other diving ducks. They seem to almost effortlessly take off after just a few steps along the water surface. Some stories even tell of them coming straight out of an underwater dive and taking off, though I myself have never witnessed this. A Butterball hen patters across the surface of the water before taking flight. Butterballs live throughout northern North America and are strong fliers. Some have ended up in Japan and other parts of Asia, while others have been seen in the British Isles and other parts of Europe. Though they tend to fly low over the water, they can also fly at very high altitudes when migrating and have a swift and direct flight pattern. A Butterball drake flying in its typical low pattern over the water. Buffleheads migrate back late in the season, they're one of the last ducks to leave for their breeding grounds, waiting until the ice breaks in their northern territories. They normally are restricted to nesting in Canada and Alaska, though a few stray into the USA and long mountain chains. They show great nest fidelity, returning to use the same nest sites year after year while they're available. Interestingly, they have a similar range distribution as a type of woodpecker called the Northern Flicker. This is because they've evolved to make use of the holes flickers make to nest in. They've evolved their small size so they can fit into these cavities (mostly in aspen trees near water) which most other larger cavity nesting ducks cannot use. It is uncommon for them to use any other woodpecker holes or larger holes because they end up being out competed, including by their Goldeneye cousins. They will however use man made nesting boxes that have similar proportions in hole size. Hens lay 4-17 creamy white eggs (though 8-10 is more typical) in their nesting hole which they line with feather down pulled from their chests. Approximate 30 days later, the chicks all hatch at pretty much the same time. A day later, they jump from their nest cavity (which could be 40 feet up though, 8-10 is more typical) to their waiting mother below who leads them to the water. Less than 2 months later, the young fledge. Occasionally, chicks separated from their siblings may join another mother's brood. If they survive their first few months, they can live quite a long life. The oldest on record was one that was banded and released that was 18 years and 8 months old in 1975. Butterballs, despite decoying easily, are not heavily hunted. Because of their high animal diet, they are thought to taste fishy and unpalatable (even if covered in butter) and so not sought after. Their numbers, despite loss of habitat, have remained steady over several years and they population is considered stable. 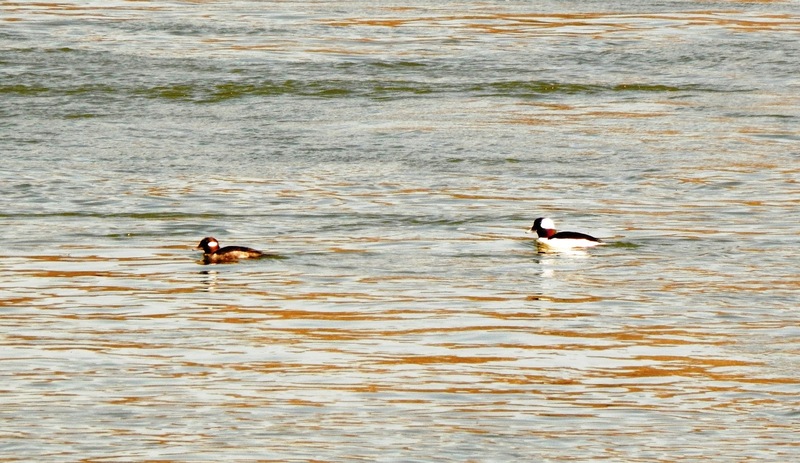 Buffleheads are one of the first ducks to arrive in our area during migration and one of the last to leave. They stay around our region in small flocks and so I get to watch their antics over most of the cold weather months during even the roughest weather, enjoying the quick disappearing and appearing acts of the Spirit Ducks. It is little wonder that these active, tough little birds were added to the coat of arms for the town of Sidney in British Columbia. I'm just glad they add to the winter spirits anytime during the cold months when the water isn't completely frozen over and I dare venture along the water to take a hike. A small flock of Buffleheads feeding on a river. ﻿ ﻿﻿﻿﻿﻿﻿﻿ The cold snap today reminded me of one of our best loved backyard birds, the Carolina Chickadee (Poecile carolinensis). The Black-capped Chickadee usually lives more North of here, although they venture into our region during severe cold weather and food shortages. Their energy and resourcefulness, along with some unique biological adaptations, allow them to live in our yards year round despite the weather. In winter, when most other insect eating-birds have migrated, they augment their diet with seeds. People who feed birds are likely to find chickadees to be among their best customers, being particularly fond of black oil sunflower seeds. Feeders can be a real benefit when it gets extremely cold (under 10 degrees F). Chickadees need 20 times more food in winter than summer to maintain their metabolisms, so the extra seed or suet can be a life saver. Finding 60% (the equivalent of 250 sunflower seeds for a chickadee) of their body weight in food each day is not easy. As if planning ahead, they frequently cache food away under loose bark or other nooks and crannies. Chickadees are extremely curious and often take unwarranted risks. Bird watchers know that it’s often a chickadee that’s first to respond to the “pishing” call “birders” use to lure birds out into the open. They often lead mixed flocks of birds in mobbing screech owls and other predators as well. Some of their many calls are used to warn each other and even other animals of danger also. Tom Starr, a notable figure in Cherokee history, claimed to have had his life saved when he heard a tsikilili (chickadee) give its warning call. He realized he was being followed and supposedly escaped to safety. To the Cherokee, a tsikilili is considered a "bringer of news". I believe Tom Starr’s story. Oftentimes I’ve heard chickadees raising a ruckus and investigated. Usually it was just a cat, but sometimes it was a snake, screech owl, or something even more interesting. Once I was testing my skills calling turkeys at a park where I worked, when the gobblers I was “talking” to suddenly went quiet. I thought I had hit a sour note when I heard something approaching me. It was a red fox, apparently looking for a turkey dinner. Several chickadees heralded his arrival, and it may have been their calls that saved a turkey’s life. The chickadees got to within a foot or so of that fox (and the fox got within 5 feet of me before I stood up and gave it a good scare), trusting in their quickness to let them get away. With that much commotion and pestering, it would have been hard to sneak up on anything. There are stories about chickadees actually yanking hair from dogs and foxes to use in their nests. It’s easy to get chickadees to nest in your yard, as they will use just about any bird box (or existing cavity), but you can exclude larger birds by making the entrance hole about 1-1/8”. Try putting a box up in February (they may even roost in it on colder winter nights) in an evergreen tree if possible. Six to 12 feet is plenty high. You can increase the chances of getting them to accept your gift by placing some leaves inside, since chickadees often use “house cleaning” as a pair bonding ritual. If you get them to nest, don’t disturb them. You might get a surprise if you do, as female chickadees can produce a scary snake-like hiss. More importantly, you can cause harm by stressing them and it’s illegal to bother nesting wildlife anyways. Chickadees raise their young as a pair. 5-8 eggs (with 6 being the most common number) of small white eggs with reddish spots are laid in the cavity. The nest is lined with moss, and often includes grass, feathers, and hair. I've heard stories of them plucking hair from live animals such as dogs, but have myself only witnessed one pulling hair off a dead red fox. It takes 11-12 days for the eggs to hatch and then another 13-17 days for the nestlings to fledge. They may raise up to broods in a season. They feed their young insects almost exclusively, with caterpillars and spider egg sacs being their favorite foods any time of year. It takes about 9000 caterpillars to raise one brood of young. In fact, some studies have shown that when live food isn't available, the young will die if fed only seed. That is why chickadees prefer to nest in places with native trees as opposed to places with nonnative plants, with their reproductive success being at stake. Some people have tamed chickadees to the point of eating out of their hands. I once did exactly this. It was amusing to watch them chisel open seeds or try and wrestle them from my fingers when I refused to let go. They seem to pick the fattest seeds first, normally taking them to a more secluded place to actually eat them. Even if you don’t have as bold chickadees as I had, these little dynamos are fun to watch all year long, whether pestering a predator, stealing a tuft of hair from a dog for their nest, or making use of a bird house. Since chickadees can live up to 12 years (though wild ones live much shorter lives) and are so easy to attract, you may want to be a good neighbor and really get to know them. A pair of chickadees enjoy a feeder meal. The Northern Pintail (Anas acuta) is one of our handsomest and most widespread ducks. The adult drake (male) is graced by a long tail (up to 1/4 of their body length) which gives rise to many of its common names: Pintail, Sprig, and Sprigtail. Even it's scientific name refers to Anas Latin for "duck' and acuta or "acute" for its pointed tail. This name was given to it in 1758 by Linnaeus himself. Young males and hens (females) lack the long plumes, but still have pointy tails. Pintails are large, though slender ducks. Drakes can be up to 30 inches long and weigh 3lbs. Hens are smaller, rarely reaching 25 inches and 2.5lbs, a size difference that is greater than in most other ducks. Their long, thin necks and slender build gives them a graceful appearance, making them recognizable even when the tail is not present. The long neck comes in useful for these dabbling ducks. It allows them reach deeper than many other ducks when tipping-up for food. Though 90% of their diet is made up of seeds and grains (they love wild rice), they also eat some crustaceans, mollusks, and invertebrates. This is particularly true in the summer and by the developing young. Their slender appearance makes them fairly distinctive in the air and gives them a sleek look. Pintails are fast fliers, with some claims they can fly upwards of 65 miles an hour. This have given rise to other common names for them such as the "greyhounds of the air" and the "greyhounds of ducks." Like other puddle or dabbling ducks, they can take off directly into the air, needing no room to run along the surface like most diving ducks do. Sprigs are also very strong fliers. Some populations regularly fly from Alaska and the West coast to overwinter in Hawaii. A leg band was recovered from a bird banded in Canada and then ended up in England 9 days later. Birds banded in Japan have been recovered in North America. They regularly overwinter in the Deep South, into the Caribbean Islands, into Central America, and have even been found as far South as Colombia. Only the Mallard is more widespread in its breeding range than the Pintail. They live in North America, Europe, Asia, even in some parts of Africa. In North America, they are far more common in the West than the East. Sprigs are early migrators also. Most start heading South in September with the majority of them out of our area by the end of November. They prefer fresh water, but will also congregate, sometimes in large flocks (often mixed in with other duck species) in estuaries and brackish water. Interestingly, though they leave winter conditions fairly early in the season, they are also among the first to return to their Northern breeding grounds in spring. By April many are in far Northern Canada and Alaska, ready to nest as soon as the ice breaks. Pintail hens use a shallow depression to lay their eggs, typically nesting their very first year. Though they usually build their nests within 40' of the water, they've also been known to nest farther away than the majority of other dabbling ducks, some over a mile away from a water source. They also tend to prefer more open areas to nest, occasionally nesting rather close to one another. In some areas, they nest in old stubble fields for instance. This preference for more exposed locations though means that they lose a fair number of nests to predation (especially to foxes, skunks, and raccoons). More over, one study in Canada showed that over half the nests were plowed up or otherwise were destroyed by agricultural practices. They are also quite susceptible to drought conditions which can cause large losses in some years. Since Pintail hens also tend to have smaller clutches than other dabbling ducks (6-8 eggs on average), their numbers can fluctuate greatly from one year to another. Despite their cosmopolitan nature, their numbers have declined steadily, averaging 2-3% declines yearly starting in the 1960's. That has led to a 72% reduction in their numbers from their historical records. In 2009, their breeding population was estimated to be about 3.2 million birds. But Pintail hens are devoted mothers. They alone incubate their clutch of gray to olive-green eggs for 22-25 days. If threatened by a predator, the mother duck will often try to distract it, feigning injury to lead it away. They will keep up the "broken wing" act for far longer than most other ducks and have been known to aggressively defend their nest if need be too. The precocial young follow the mother to water soon after hatching. It normally takes them a little under 2 months to be able to fly, though they may hang out with their mother longer than that. In the far North where the days are longer to allow them to feed almost continuously, the young may mature much faster and be flying in under 5 weeks. If they're lucky, they can live for quite a while. The record for the oldest North American Northern Pintail was by a drake from Saskatchewan, Canada who lived to be 22 years and 3 months according to his recovered leg band. A Pintail in Holland supposedly lived to be 27 years and 5 months. I don't get a chance to see as many Pintails as I do other ducks. So I'm thrilled when see them during the Fall migration, or hear the drake's whistle or hen's quack. Sometimes I only catch a brief look at their sleek flight as these wary birds fly by, but it's always nice to see. There are about 95 species of kingfishers (depending on which expert you listen to) worldwide. There are 3 that can be found in North America, but only one in the East and throughout most of United States and Canada, the Belted Kingfisher (Megaceryl alcyon). Their scientific Genus name is derived from "mega" meaning "great" and "Ceryl" who was a Greek lady who was tragically grieving for her drowned husband before the gods turned them both into the first kingfishers. "Alcyon" is Latin for "kingfisher" but derived from another myth where Halcyon was punished for claiming to rule the gods, but later was allowed to become a bird. These mid-sized birds have many features fairly unique to them. First of all they're sexually dimorphic. Now many birds are, but in the vast majority, the males tend to be larger and more colorful. It's just the opposite with kingfishers. Not only is the female slightly larger, but also has brighter coloration. Female Belted Kingfishers also have an extra chestnut-colored band across their chest that the males lack. As part of their pair bonding ritual, males typically give a fish to the female in what has been called by some a matrimonial testament that they are good providers. A female Belted Kingfisher shows its extra "belt" mark across its chest, though the fused toes are not that evident. Kingfishers have a top-heavy look. They have big beaks and large heads, but very short legs. More over, they have unusual toes. Two of them are actually fused together. This strange arrangement allows them to be used as shovels when pushing out dirt. That's another strange aspect to these birds. They actually nest in burrows underground for the most part. They seek steep banks with loose soil and then excavate a burrow, first using their stout beaks to peck out chunks, and then shoveling them out using their strange feet. Both the male and female take turns digging. It may take them from 3 days to 3 weeks to dig their tunnels, which angle upwards in case of flooding. Since they may use the same site each year, these burrows may range from 3 to 15 feet in length, extending deeper each year as they clean them out. At the end of this burrow, the mother lays 5-8 white eggs which are incubated by both parents. The female tends to sit on them at night while the males take over during the day. In 22-24 days, the young are born. The nestlings cling together to maintain body heat. They are fed by both parents, starting with partially digested fish before moving on to whole fish. The young leave their holes about 29 days later, but stay with the parents 3 or so weeks more. During this time, they learn to fish, this sometimes taking the form of having the adults drop food into the water for the young to dive after. Belted Kingfishers are sit-and-wait predators. They normally sit on a perch where they have a good view into the water. Upon seeing potential prey (mostly fish, but also crayfish, molluscs, amphibians, even small reptiles or mammals, whatever is available), they either drop down or hover over top. They dive into the water to seize their prey, normally flying back to their perch once they're successful. There they typically beat the fish into unconsciousness against the perch before tossing it into the air. They catch the fish headfirst, so the spines are less of an issue as they are swallowed whole. Later on, inedible parts (scales, bones, etc.) are coughed back up in pellet form. Belted Kingfishers migrate all the way into Central America and the Southern states. Occasionally they've turned up in South America and even Europe. But many also stick around as long as they have open water to fish and the prey remains available. Belted Kingfishers require clear water in order to be able to see their prey. Populations have declined of late, but this bird still remains one of the most widespread in North America. I am thankful for this, as I love hearing their rattling call. I've often enjoyed their company and fishing ability while fishing myself, although I'm sometimes jealous of their success.